Creating a 2.1 version of the New Orleans brass sound. 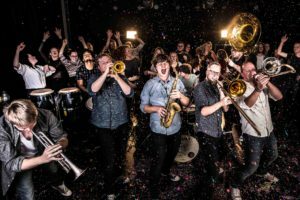 Broken Brass Ensemble injects the traditional New Orleans brass with a fusion of hiphop, funk, soul, dance, jazz (and much more) and turn it into a blazing mixture of energy. They’re taking brass to a new level, creating a 2.1 version of the vibrant New Orleans brass sound and this eclectic and energetic sound has been running up a storm over Europe. Live they deliver hard-hitting brass sounds and their interactive and riotous live shows have seen them conquer crowds all over Europe. They have sold out shows in UK venues in London, Manchester, Exeter, Norwich only on their live reputation and festivals in France, United Kingdom, The Netherlands, Germany, Switserland, Belgium have witnessed the power of their live show. With more than 250 shows in under three years Broken Brass Ensemble have most definitely become a live force to be reckoned with.